A cloudless sky and there was no rain when suddenly without warning an apocalyptic lightning hit several countries in Europe, mainly in France, Germany and Poland on May 28, 2016. In Germany more than 30 residents of Hoppstädten were taken to hospital, when lightning struck at the end of a junior football match, a man in Poland dies after being struck by lightning and in France eleven people were injured when lightning struck as they were celebrating a birthday party in a park in Paris as reported by several news sites. Strange weather radar anomalies over Croatia on May 26, 2016. Weather experts said the thunderstorms were the result of a very “unstable” atmosphere over north-west Europe, however, two days before, on May 26, 2016, the weather radar networks from Germany, Poland and Czech Republic, radar.eu, showed a mysterious weather radar anomaly which suddenly appeared over the region of Osijek in Croatia. The unexplained weather anomaly could be just the result of a malfunction during the radar processing however on May 8, 2016, a similar weather anomaly appeared over Switzerland and also at that time it was a cloudless sky and it was not raining. Coincidence, two malfunctions during radar processing done by two different weather radar networks, it seems unlikely. It is said that CERN, the European Organization for Nuclear Research, is the culprit behind the strange weather radar anomalies. Moreover, if you know that currently they perform a cloud experiment at CERN we wonder whether these anomalies and the unexpected massive lightning over Europe are the result of CERN's weather program. 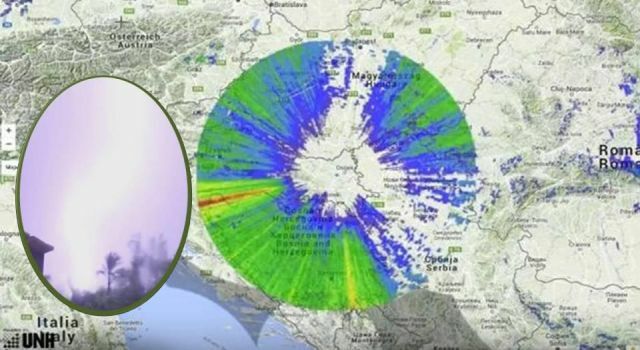 Below video shows the strange weather radar anomalies over Croatia. Clouds reflecting objects in the sky? Aluminum from chemtrails or just ice particles? Weird lake object - Is this natural phenomenon or something else?